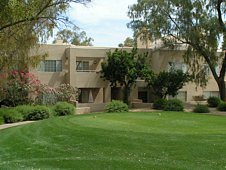 These condos are located adjacent to the Estate Club, which houses Gainey’s fitness, tennis, and swimming center. Tennis court use is included in the ownership package. Condo sizes range from 785 to 1203 square feet and the HOA fees run $450 per month. You can forget exterior maintenance expenses . . . these are included in your HOA fee, as is the case with all the Gainey Ranch condo developments! Prices start around $225,000.